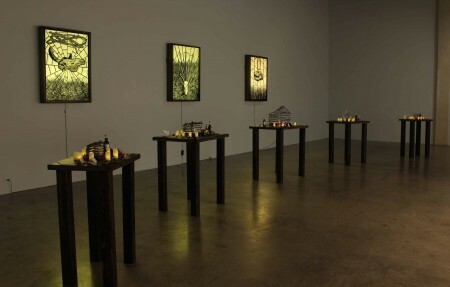 Dan Heskamp’s MFA exhibition Expanding Our Empathy opened on May fifth in Texas A&M Corpus Christi’s Weil Gallery. 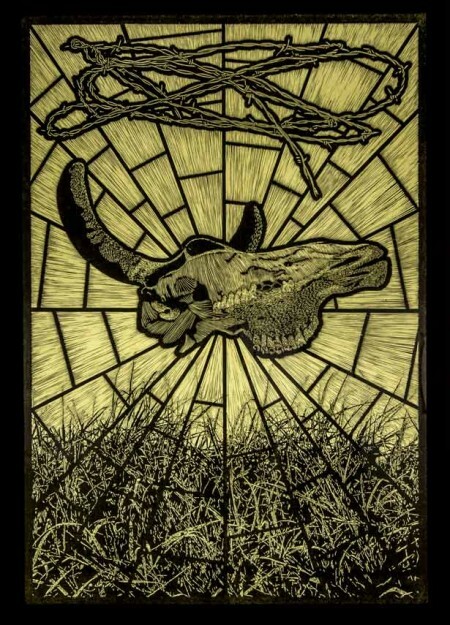 The exhibition featured a variety of media culminating his terminal education in an enormously successful display of woodcut light-boxes, aluminum and bronze cast altar pieces displaying locally sourced animal skeletons, and a series of smaller serigraphs. Heskamps’s work is meticulous, large, time intensive, and emotionally sensitive. Animals are just as consciously apt as humans. The imagery bears a cross of asceticism that’s borderline monastic. Walking into the gallery the viewer is affronted with an atmosphere of spirituality rooted in Heskamp’s Catholic upbringing. His work is primarily concerned with the veneration of animals. The artist shines a saintly light on carcasses frequently taken for granted. Heskamp’s preoccupation with the animal world began at an early age. He watched the Discovery Channel with eager fascination and at some point had thoughts about becoming a vegetarian. He thought to himself, “Being a vegetarian must be pretty expensive though.” You’ll be glad to know that the prohibitive cost of vegetarianism did not ultimately prevent Heskamp from realizing his true self as it relates to meat. About five years ago the artist made a decision to eat less meat, which after about a month gave way to fully-fledged vegetarianism. This decision coincided with the maturation of his artwork. The work, at the time, had taken on themes of baits and trappings. The religious aspect of Heskamp’s work, which imbues the darkened gallery with the divine, is purely vehicular. Catholicism is an aesthetic tool of veneration. Heskamp essentially appropriates the preachy to escape them. The Catholic aesthetics of stained glass and saintly reliquaries is transposed onto the earthly remains of animals discovered and manipulated by the artist. The result is a context for consideration through wonder. Since Catholicism is extremely popular in South Texas, many people are familiar with the culture of iconography. The Bible also predicates man as the superior being. Many religions position man as secondary only to the celestial bodies. However, the presentation of animal bones in a context of human religiosity creates a space where the uninitiated can meet the message in a place that seems relatively common. The very nature of religious architecture is awe inspiring and generally somber, beguiling and sweet; the model’s transmission is time honored. The most central underlying aspect of many religions is in propagation of compassion, and goodness. Heskamp mobilizes holiness in his favor. It would seem the method is wonderfully clean in its generation of sympathy. The exhibition is centered around three gigantic woodcuts displayed in light boxes hung on the galleries’ largest wall. Their light illuminates the space most of all; the lights are low. Each woodcut is intertwined with a Saint, and arranged before the illuminated woodcuts are a series of four reliquaries. 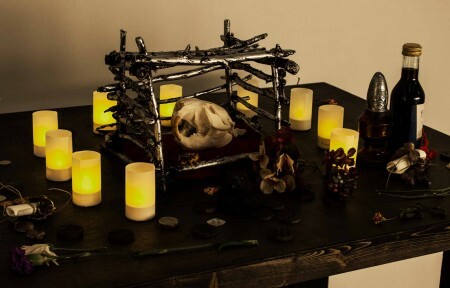 The reliquaries are cast of metal in the image of small structures of wooden sticks tied together. Within each are animal bones arranged anatomically on a velvet pillow. Around these reliquaries, that suggest martyrdom, visitors can offer tributes. Heskamp made tributes available in the form of hand stamped wooden coins. Gallery goers also improvised tributes. 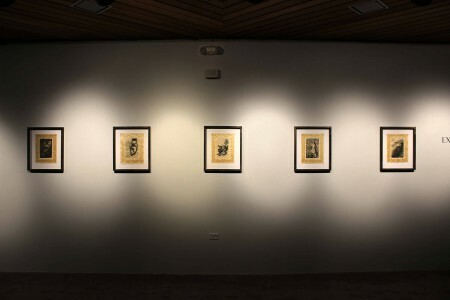 On the galleries’ back wall, Heskamp displayed five screen prints. The prints feature black and white images of discovered animal remains. The images are overlain with golden script that presents essential facts concerning the decaying animal depicted. These images reference the tradition of illuminated manuscripts. Throughout the rest of the gallery, in the darker corners, Heskamp has arranged bones and sticks utilizing the formal attitudes of those bare bones, without passing them through the sieve of media. Heskamp’s MFA exhibition was contextually appropriate, compassionately motivated, and utterly efficient in its transmission. From a printmaker’s perspective Heskamp makes productive use of the process to accommodate and generate an application that’s intermingled with religious architectures on nearly every level, while remaining free of pretension. The political message is humbly conveyed and hardly declared. The literal and the conceptual are beautifully married in such a beautiful chapel.